A useful update to an already brilliant and incredibly fun app, particularly for those who like to make their own controllers. Endlessly versatile. Lots of useful templates. Easy to edit. Great Ableton Live controller. Excellent step sequencing tools. Some timing issues over Wi-Fi. Programming Lemur is not for everybody. About seven years ago, before touchscreen phones and tablets became ubiquitous, Jazz Mutant unleashed their futuristic Lemur MIDI control surface, offering fully customisable OSC/ MIDI control via a multicolour touchscreen with up to 20 simultaneous touch points for a bargainous €2400. Today, that kind of money will buy you an iPad Air, a MacBook Air, any DAW you like and the latest version of the Lemur iOS app - for such is the form that Lemur (acquired by Liine a couple of years ago) now takes. "Even before the v5 update, it was a must-have, particularly at this price"
This is the first time we've reviewed iOS Lemur, so let's start by saying that even before the v5 update, it was a must-have, particularly at this price (to be honest, the original hardware was winner, even at over two grand!). So what's it all about? 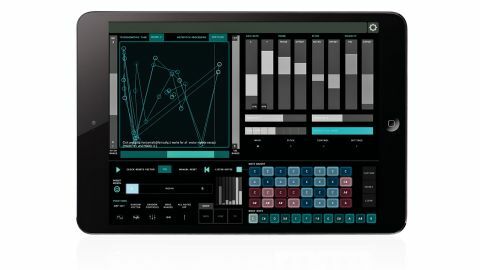 Lemur is a multitouch MIDI/OSC controller, the specifics of which are entirely user-programmable. Connecting via OSC and MIDI over Wi-Fi or USB, it can be used to control just about anything that accepts MIDI or OSC input, including your DAW, standalone virtual instruments, plugins, hardware (using an appropriate interface) and even other MIDI-enabled apps on your iOS device (using an iOS MIDI-routing app). There are many controller apps available for specific applications and plugins, but very few freely customisable ones, and Lemur is arguably the most versatile. Bundled control templates include everything from basic drum pads, keyboards, step sequencers and mixers to complex envelopes, LFOs, app-specific setups (including one for Ableton Live) and physics-based modulation controllers. A particularly cool one involves four X/Y control pads, the control points of which can be 'thrown' into perpetual motion, constantly sending out control signals. Said signals in all templates are always entirely (and fairly easily) customisable. Some projects also offer Tab buttons to hop between different controller Containers within one project, allowing you to - for example - move from controlling faders to playing a step sequencer to generating intricate modulation signals at the touch of a button. Thus, you can control any number of things, in any number of ways, all from the same app, all at the same time. Lemur users can be comfortably split into three groups: those who build their own presets, those who customise existing projects, and those who never go beyond the fantastic projects and presets available in the app and online (there are plenty on the Liine website). The v5 upgrade is especially exciting for the first group, as its big new feature is the ability to create nifty graphics, but it will reward the other two groups, too, ultimately, once the community embraces it for the construction of a 'new generation' of presets. There are a couple of negatives, though. Step sequencer looping can sometimes be glitchy over Wi-Fi (which is why Liine recommend cabled MIDI for live work), and in truth, only the most committed users will actually get anywhere making their own templates, as while version 5 makes Lemur easier than ever to program, it's still not for the faint-hearted or non-technically inclined. However, whether you make music in the studio, on the bus or on stage, if you own an iOS device, Lemur 5 is an essential purchase.